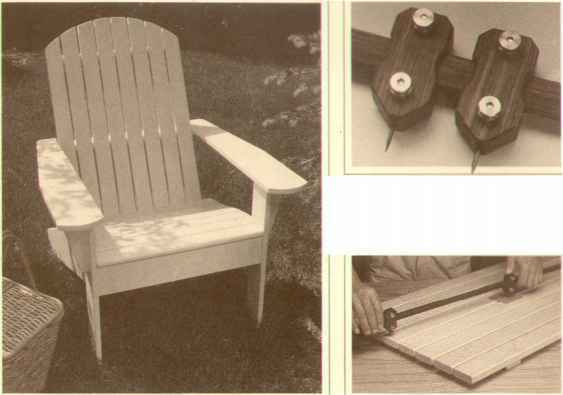 As mentioned in Talking Shop on page 29.1 used Minwax's High Performance Wood Filler for filling the counterbored holes before painting the pine version of the Adirondack Chair shown on the back cover. This filler is available at many local home centers, and paint and hardware stores. If you can't find it locally, it can be ordered through the mail from The Woodworkers' Store, 21801 Industrial Blvd., Rogers, MN 55374-9514; phone (612) 428-2199. For finishing the redwood Adirondack furniture, I used a mixture of 50% McCloskey's Man O' War Satin Spar Varnish and 50% McCloskey's Stain Controller & Wood Sealer (for more information, see page 29). These products are available at some local retail stores and home centers, and can also be ordered from The Woodworkers' Store (see address above). A Knurled bras* finger nut a on this shop-built Beam Com/toss contrast with the dark ivood of the trammel head*. A hole in each head holds a steel point or a drafting had.